Designed to lift long objects or large pallets with a fork trucks/ forklift. Forklift extension tines are ideal for extending standard forklift tines to safely pickup and carry oversie loads. 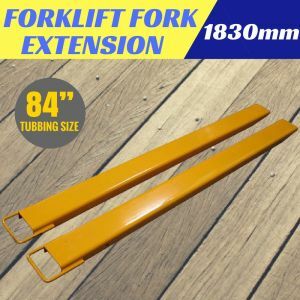 Forklift extension tines should not extend the length of your forks by more than 50% please ensure you order the correct size for your forks. Can be fittted or removed in seconds. 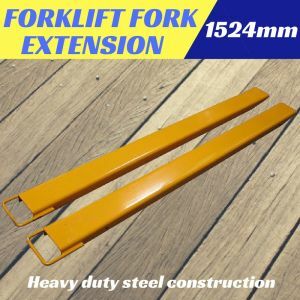 Heavy duty steel construction, fits forks up to 50mm thickness. Steel retaining strap prevents forks extensions from sliding off forks during use.